When Walt Mossberg interviewed Steve Jobs on-stage at last week’s D: All Things Digital conference, he pressed the Apple CEO for an exact release date for the iPhone. “Late June” replied Jobs. “Like the very last day of June?”, countered Mossberg. “Err, yeah”, Jobs confirmed with a broad smile. Well, it’s now official. The iPhone will hit Apple and at&t stores in the US on June 29th. Now armed with an exact release date, last night Apple kicked off its television advertising campaign. Three commercials have been produced (available on the company’s website) giving us a good insight into how Apple plans to market the device. 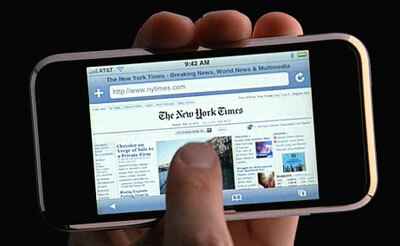 Here’s a break-down of the three ads, and how they attempt to position the iPhone. 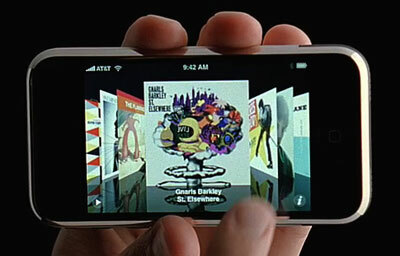 The advert pitches the iPhone as a next-generation iPod, highlighting the device’s innovative multi-touch interface. The intended take-away is that this is the best iPod ever, and by the way, it’s a phone too. A finger scrolls through iTunes library, switching to cover flow view. The second advert continues to show-off the iPhone’s multi-touch interface but places less emphasis on its iPod heritage, and instead focuses on the device’s Internet capabilities. In particular, Apple is keen to demonstrate that the iPhone can display rich emails (with embedded images) and access the full web experience — not the ‘baby web’, as Jobs likes to stress. Once again, the fact that it’s also a phone is teasingly left right till the end. Launches iPod app and once again demonstrates cover flow. Browses email and open a message with an inline photo attachment. Opens the iPhone’s web browser, Safari. Visits the New York Times’ website and zooms in on the page. The third commercial highlights two features, in addition to the device’s cell phone-functionality: playing hollywood content and Google Maps integration. The ad begins by playing a scene from Pirates of the Caribbean, cutting to a shot of a ship being attacked by a giant octupus. Then in a play on imagery, the user searches for a sea food restaurant using the iPhone’s rich Google Maps client app. After locating a place to eat, with one-touch the iPhone rings out to the restaurant. Switches on iPhone by sliding the touch-screen button with a single finger. Watching movie in widescreen, cuts to shot of an octupus. Exits iPod and launches ‘Maps’. Types in ‘seafood’. 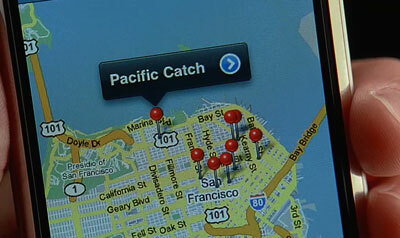 Google maps zooms in on ‘Pacific Catch’, North of San Francisco. Cuts to a shot of contact details for ‘Pacific Catch’. Cuts to a shot of the iPhone calling out. All three commercials put the attention onto the iPhone itself — we don’t learn anything about the person operating the device. 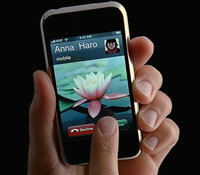 The voice-over is also very sparse, letting the iPhone’s multi-touch and graphical interface largely speak for itself. This is especially true in the first advert where the dialogue is non-descript (play the advert with your eyes shut and you won’t have a clue what it’s about — until the phone finally rings). Overall, the campaign seems to be emphasizing the rich user experience and plays on the iPhone’s Internet and multimedia functionality — an area where Apple clearly feels the device trumps its competitors — with a constant theme being that the iPhone just happens to make calls too. Nice zen-ness to the limited colour palette and script. Fits in with Apple’s simplicity for such a complex device. I’m also waiting for the UK release. The ads are some of the best from Apple in years. I don’t know why they don’t market the Mac OSX in the same way — instead of just showing off the hardware looks. can anyone tell me where to get that song from the ad and who the song is?